The Temple Mount (Hebrew: הַר הַבַּיִת‎, Har haBáyit), also known as Mount Moriah and by Muslims as the Noble Sanctuary (Arabic: الحرم القدسي الشريف‎, al-haram al-qudsī ash-sharīf), is a religious site in the Old City of Jerusalem. Judaism regards the Temple Mount as the place where God chose the Divine Presence to rest, it was from here the world expanded into its present form and where God gathered the dust used to create the first man, Adam. The site is the location of Abraham's binding of Isaac, and of two Jewish Temples. The first was built by Solomon the son of David in 957 BCE and destroyed by the Babylonians in 586 BCE. The second was constructed under the auspices of Zerubbabel in 516 BCE and destroyed by the Roman Empire in 70 CE. Jewish tradition maintains it is here the Third and final Temple will also be built. 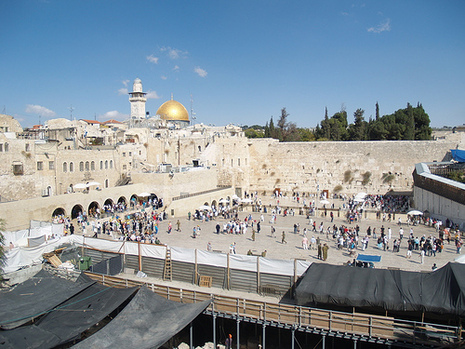 The location is the holiest site in Judaism and is the place Jews turn towards during prayer. Due to its extreme sanctity, many Jews will not walk on the Mount itself, to avoid unintentionally entering the area where the Holy of Holies stood, which contained the tablets on which the Ten Commandments were written. It was from the Holy of Holies that the High Priest communicated directly with God. The tablets may still be buried in amongst the rubble from the destroyed Temples and Jews yearn to re-establish that direct connection. 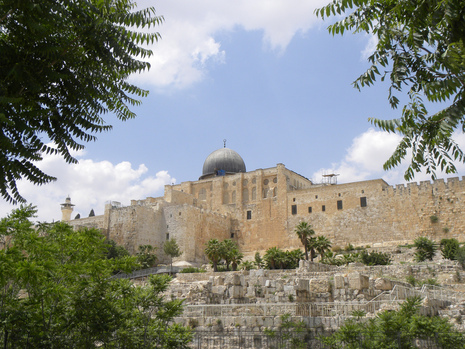 The Temple Mount (Hebrew: Har haBáyit) or Noble Sanctuary (Arabic: Haram esh-Sharif) is a elevated plateau in the Old City of Jerusalem rich with history and religious importance. It is currently governed by the Waqf, or Supreme Muslim Religious Council. 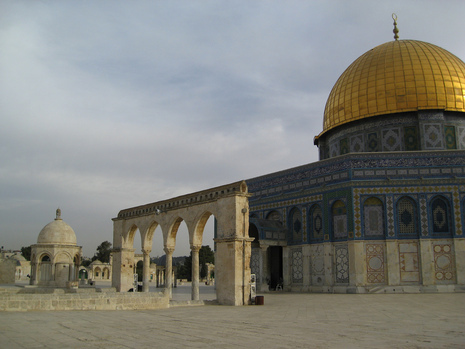 Like many sites in Jerusalem, the Temple Mount is sacred to Jews, Muslims and Christians. Originally, it was the site of the great Temple of Jerusalem, the holiest place in Judaism. For Muslims, it is the site of the Prophet Muhammad's journey to heaven described in the Qur'an. Finally, Christians revere it as a place frequently visited by Jesus and some believe it will play a major role in end-time events.